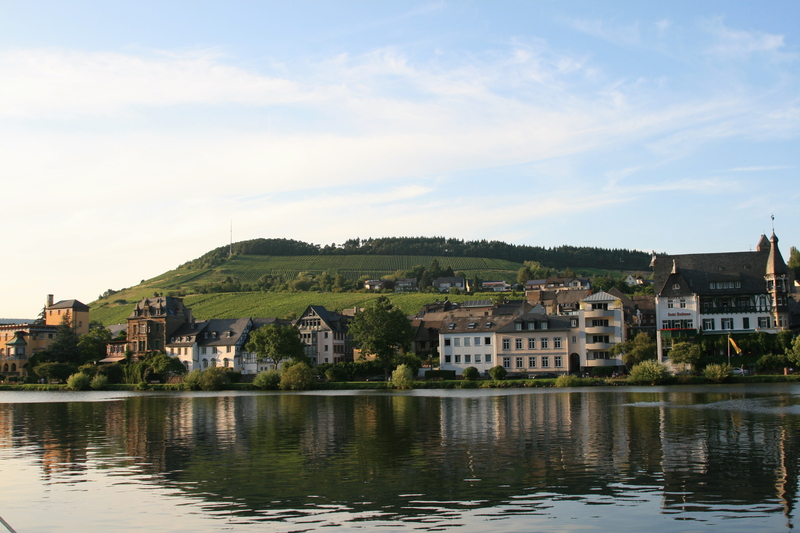 Stunning views in the Mosel. The wines can be exceptional. German white wine is probably the wine lovers best kept secret. It only takes a few tastings of a German Riesling, whether bone dry, semi-sweet, sweet or even in its ice-wine variety and you are likely to be hooked. Riesling ages incredibly well, is very versatile and changes character along the way. It is also extremely versatile with food. When the wine is not mass-produced, and mass production is probably one of the reasons why it had such a bad reputation, it can be brilliant. It also provides exceptional value for money. A good Riesling to me has unique qualities. It is fresh, vibrant and has a great perfume. The freshness can be surprising even when you are drinking an older wine. It is not uncommon to open a 10 to 15 year old dry wine and still find incredible freshness. 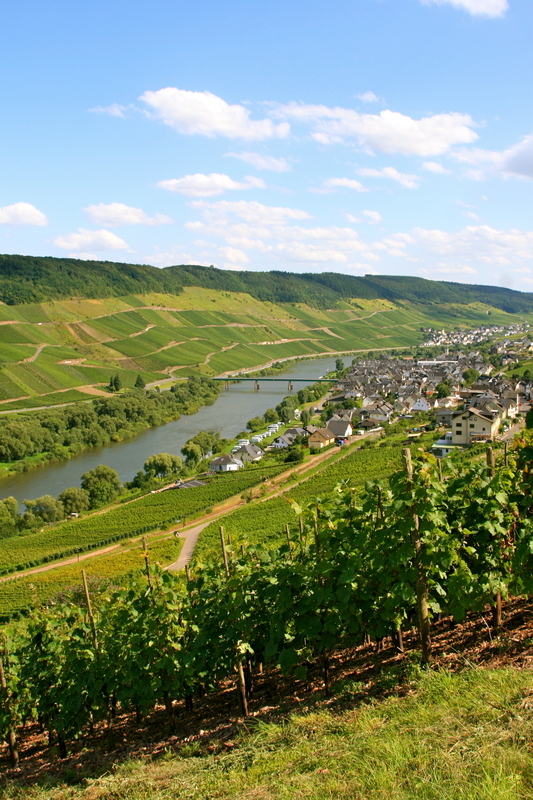 The Mosel Valley is a beautiful and scenic region in Germany and exploring the vineyards and wineries is a great way to get a taste of German culture, its people and some wonderful wines. Most of the region is centred around eating and drinking. For non-German speakers, German wines can be intimidating because of the labelling even though once grasped it is incredibly simple and extremely transparent. 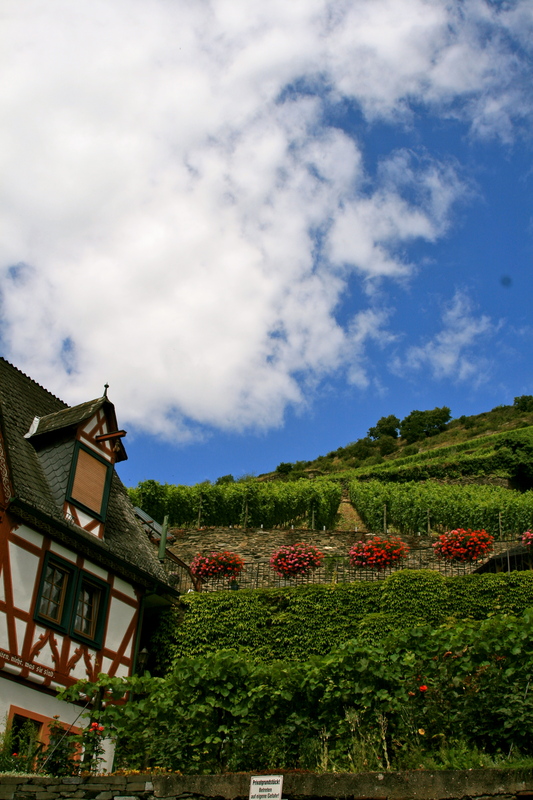 The classic gems of German wines are sweet wines which are best enjoyed alone. I have quite a number of sweet wines in my cellar which can be savoured over the years given the ageing potential is huge. However, because sweet wines are no longer so much in demand, German producers have opted for dry wines called trocken. When it is medium try it is called halbtrocken. 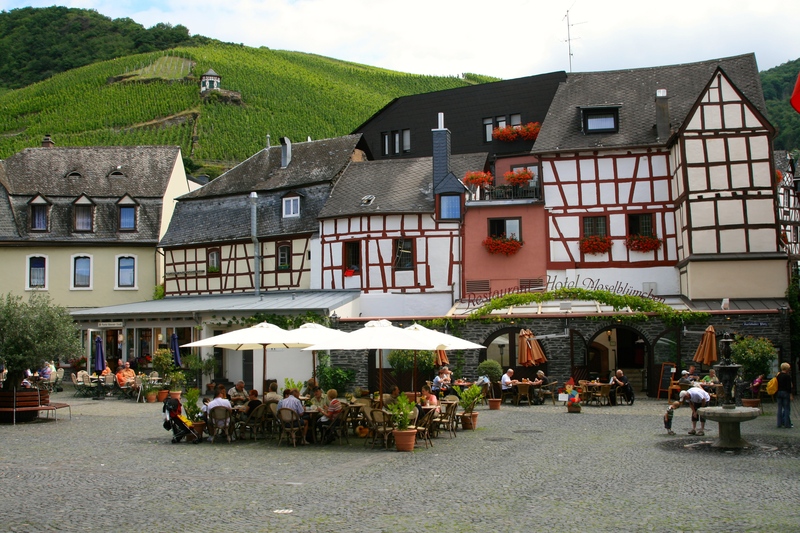 This weekend, we tasted two different wines from the Mosel. They were from Weingut Lotz. We tried two wines from the same terroir. One was a 2010 and the other was a 2013. Both were great but also incredibly different one could not help wonder whether the 2013 would develop in such a way. The location of the vineyards that produce these wines is the Erdener Herrenberg. The slate-stone ground is very weathered and produces wines with a special minerality. We first tried the 2010 Riesling Schieferstein from Weingut Klaus Lotz. For a four-year old wine this still had incredible freshness. It is complex on the nose with hints of exotic fruits. It has the right balance between acidity and sweetness and goes perfectly well with a light meal. We tried it again a day later and it still showed the same sort of freshness indicating that it still has the potential to age. Overall this is an incredible value for money wine. 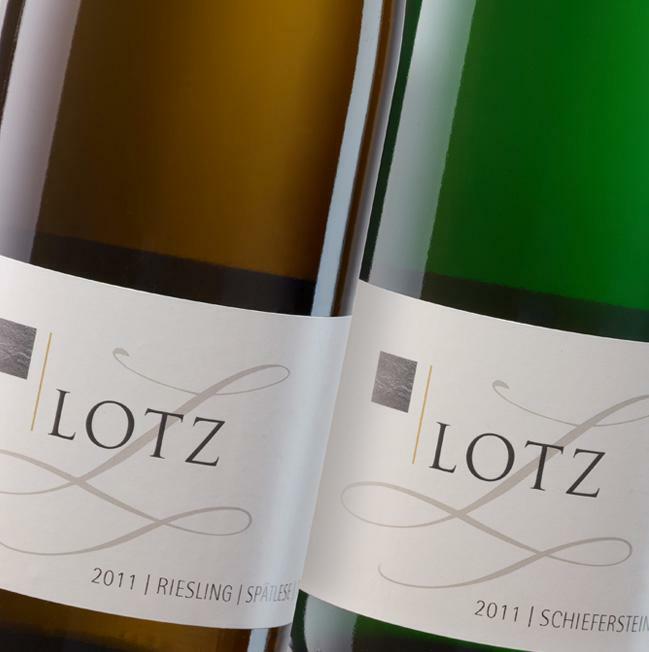 The 2013 Lotz Schieferstein from the same producer has different labelling now. This is the sort of wine that you will enjoy drinking when it is extremely hot. It is crisp and has great acidity. It is not as complex on the nose as the 2010. It is indeed rather gentle on the nose though it has a really nice aroma which reminded me of marzipan. To me this was a perfect wine to drink as an aperitif also because the finish was not as long as the previous wine. Overall, it was still fantastic. The great thing about Rieslings is their ageing potential and therefore the possibility to try different wines of different vintages. You do not need to worry if you don’t finish the wines. Firstly these two wines had a screw cap. Moreover, given that these wines can age, you can actually test their ageing potential by trying them days later. If they still taste good, then you know that they can still age. The only problem with these wines is that they are so hard to find. But that makes them all the more alluring. Summer has started and we have had our fair share of barbecues already. Crisis point was reached a few days ago when we ran out of our special mustards with tarragon and Riesling which we had purchased from our annual visit to Monschau, Germany during the Christmas season. We had never visited the idyllic town during spring or summer for some reason and have always associated the town with winter especially given how spectacular it looks when it snows. 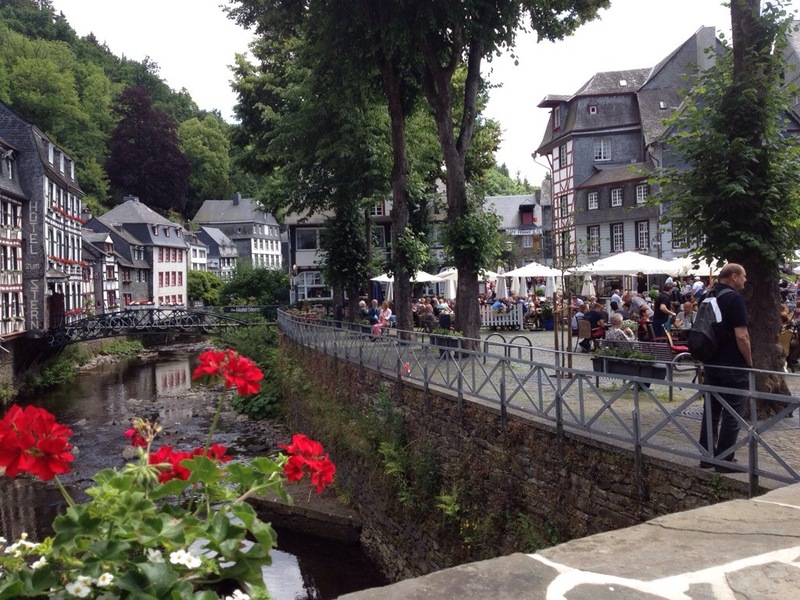 So, we did what some might consider a crazy day trip, which is heading to Monschau to stock up on mustard lest our barbecues suffer from the lack of magic ingredients. Now you might probably have realised that when it comes to food, I do not cut corners and am bound to take a detour if I can procure great ingredients. But, given the fact that until a few years ago, I was not really keen on mustard, you will understand that the Monschau mustards are indeed special. All it takes to convert to the joys of mustard are a trip to Dijon or Monschau, away from the commercial stuff you find in supermarkets. 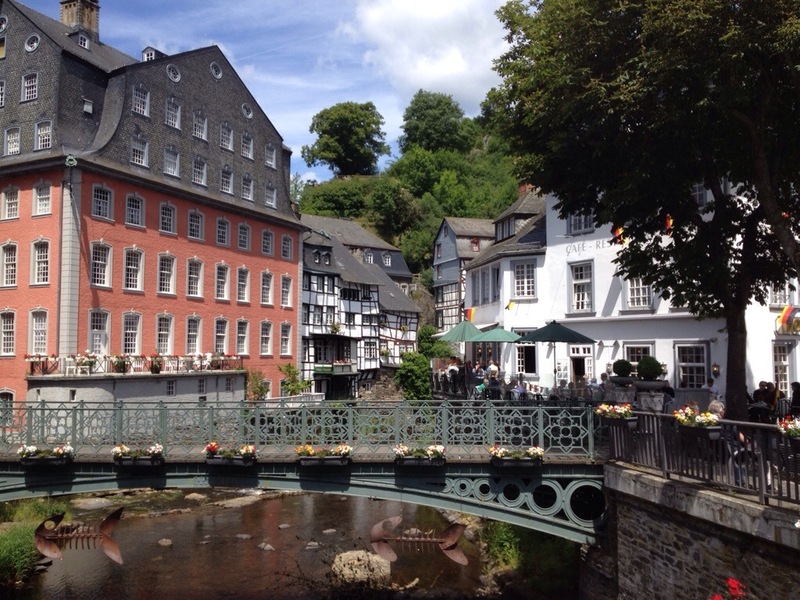 But back to Monschau. 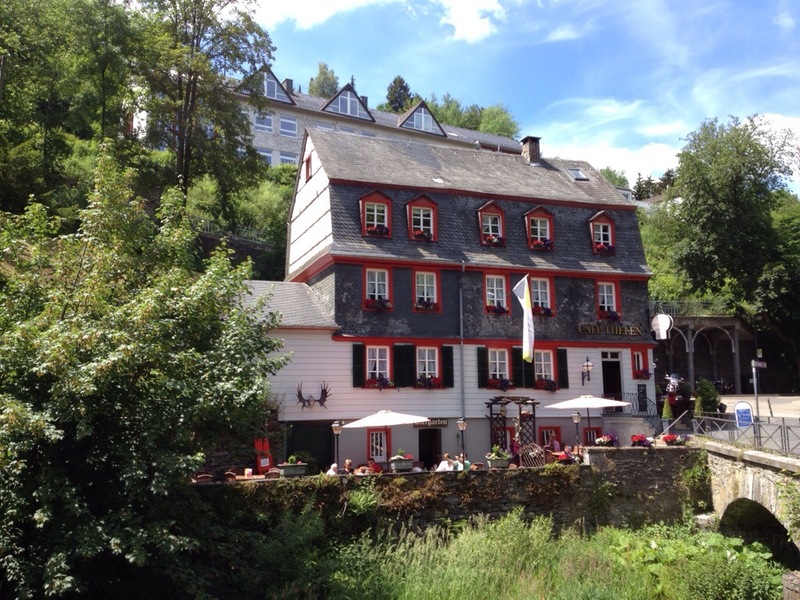 Monschau is a beautiful town located in the hills of the North Eifel within the Hohes Venn – Eifel Nature Park in the narrow valley of the Rur river. The historic town centre has many preserved half-timbered houses and beautiful narrow streets which look as if they have remained unchanged for time so long. The setting is fantastic given the town is literally in a valley and is surrounded by beautiful hills. The town is extremely picturesque. In summer, all the restaurants and hotels have tables outside making dining al fresco a joy given the stunning vistas and fresh air. A few shops are worth visiting including some cafes which serve typical German cakes. A bakery just off the main square has typical German breads and sweets from the region while the special mustard shop sells a lot of regional produce including alcohol and pork products. Mustard here varies from the classic, which is spectacular used in a salad dressing, to tarragon, garlic, chili, green pepper, old German, Horseradish, English curry, caraway seeds, lemon, orange, tomato, currant, honey with poppy seeds, fig, Riesling, wild herbs, ginger and pineapple as well as the new beer mustard which also promises to lift our coming barbecues to something special. The drive there from Belgium is also spectacular. You pass through Eupen, a very pretty Belgian town from the German speaking part of Belgium and then through the the Hautes Fagnes, which is the highest point in Belgium at an altitude of 694 metres. Verdict: A great place to visit both in summer and winter. If you go in winter, try to visit when it has snowed because the charm of the place is incredible. In summer the town also has great charm.